I was really looking forward to this week! After all, it was Publix Savannah Women’s Half Marathon and I was so excited for a few days in Savannah with some of my friends. Happy Easter! We were exhausted from a late night but little man was so excited for the holiday, so we got ourselves up and going. He loved hunting down his basket, and then we had a chill day at home with a ham dinner. I had hoped to go to the beach to eat, but the high winds just weren’t conducive to a nice al fresco meal. After our dinner, my mom and I went for a walk around the neighborhood while little man rode his bike. I was stunned to see how much he’s grown, because we had to lift his seat and handlebars a couple of inches. The first day back after Spring Break is always tough. We focused on getting back to a state of normal after all our excitement. Not much to say about this run. We did it. I had work, and little man had music practice. We also had an open PTA meeting that evening which meant spending another hour at school and going out for pizza after. It felt like a while since we had been in the gym, and an arm workout was just what we all needed. I felt great when it was over. I was also glad when work was over, too. It meant I could focus on my upcoming weekend away. Mr PugRunner took little man to his karate class and I spent some time cleaning up around the house and thinking about packing. Last run before Savannah. I wanted to go a few more miles, but decided to hold off since I had big plans for the day. First, I got little man off to school, along with a large donation of books and little kids’ furniture for one of the kindergarten teachers. From there, it was off to the store to pick up gallons of water for the water stop that the Scouts had committed to for the ready. Set. How 5K, and then pick up little man’s packet for the same event. I had promised my parents I would meet them to go to the beach to look for the shipwreck that washed ashore a couple of weeks ago, and so I hustled over to the area where we were supposed to be able to find it. With the wind and soft, shelly sand, it was probably the hardest beach hike I have ever done. Totally worth it, to find the remains of a ship believed to have been built in the 1830s-1860s. Experts are still looking for answers, but in the meantime, it was really cool. At this time, they are still struggling to get the ruins off the sand, so it’s still available to be seen. I highly recommend it. That evening, the Webelos earned another optional adventure. We are winding down for the year, so I am trying to help them earn as many achievements as I can. Time to go! After little man headed off to school, I finished collecting my things. Meghan arrived close t0 10 and we hit the road! There was a ton of traffic, so our normal drive to Savannah took about an hour longer than planned. Ugh! We made one stop on the outskirts of town to get Meghan some new shoes, and then we completed our drive to The DeSoto for check in. We were famished, so after we stored our bags (our room wasn’t ready yet), we made our way out to grab a quick bite. With full tummies, and a much better outlook on our day, we returned to the Fashion Fitness Expo to pick up our bibs and participant gift (a gorgeous backpack), and do a little shopping. In the meantime, Mr PugRunner was off with little man, chaperoning a field trip. M and S, from back home, met us at the Expo a little while later. I was so excited that my running friends were going to meet! We grabbed Amy and headed out for our traditional Treylor Park dinner, dessert at Leopold’s and then back to the hotel to get into bed. Little man, on his end, ran a really wonderful 5K, as well as volunteered with the water stop before and after his run. Rockstar. I was so proud of him, but also sorry to have missed it. Since our hotel was only a few blocks from the race start, we got to “sleep in” until about 6:00. Yay! We collected Amy and walked over to the start line. The race was wonderful, as always, and I will fully detail it in a dedicated post. But we finished strong and had a blast doing it! We showered and changed, and then it was off to a celebratory brunch. The big damper on the day was the unrelenting rain! Ugh! However, we made the best of it with a visit to the American Prohibition Museum, lots of shopping and a delicious dinner. More on all that soon! After all the walking around the city, we were fairly ready for another good night’s sleep! Such a fabulous week! I look so forward to these Savannah racecations, and I am so grateful for the amazing running friends I’ve met along the way. These strong and incredible women inspire me and I can’t wait for our next race adventure! Do you have a group of running friends who inspire you. Have you ever seen a shipwreck up close and personal? I love it, too! They are already talking about the next time we go away! I’m ready! I now wish I had run the Savannah women’s race!! So many people that I knew ran it! 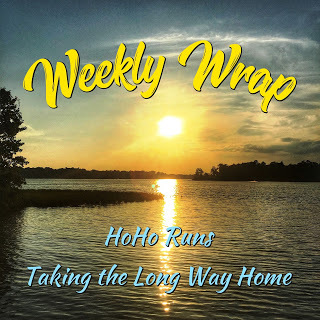 Smitha @ FauxRunner recently posted…Weekly Training Recap – Here we go again! Next year! You have to do it! Congrats on a great week and another completed race weekend! I love the tank that you wore for the race too. My run coach Abby also ran this race and said how much she loved it. It seems like it’s so well organized with great race swag! I am fairly sure I saw Abby on the course – I was kind of struggling a bit and was a little out of it, but I would swear it was her! It is just the right size that they can pay attention to all the little and extra details. The course is quite beautiful and different than the other huge half marathon in town, so there is some variety. I honestly hope to be running it for years to come. We do leave a few hours between the end of the race and brunch, just enough time to shower, get out any GI issues and get ourselves nice and ravenous. You have to brunch on Saturdays in Savannah because of their blue laws – no alcohol served on Sunday before 12:30! Wow, the wreck is really super cool, I’m glad you went out there. Is there a chance your son will get to see it? It’s cool that he ran the 5K while you did the half marathon, and that someone else (husband? grandparents?) was able to help him out with that. I love how you mix in things like the wreck and the museum, you do keep things interesting! Our friends with a son his age helped keep an eye o him. He can and has done it himself, but it’s dark and it’s just nice to know there are extra eyes watching out. I am hopeful that he will get to see the wreck, but with him being back in school, it’s a bit harder to get there, especially since it’s on a more residential bit of beach, so not super easy to hike to (honestly, it was one of the hardest beach walks I’ve ever done). We will see how the weather holds the next two weekends and go from there. He was really into the pictures, so I’d like for him to see it up close and personal. That shipwreck is so cool! I”ll have to ask my friend who has a place down there if she saw it! I am so looking forward to your Savannah race recap–I really want to do this one! You really need to come down and do Savannah! Really! Your friend should definitely try to get out there if she can. They are having a hard time getting it off the beach, so I think it will be there for a while. Sounds like a great weekend away! Looking forward to your recap and congrats to your son ! It really was one of the best! Thank you! Aw, I love that your son has caught the running bug from you! How awesome that he did a 5K and helped at the water stops while you were racing. I’m really proud of both him and my husband. I thought it would be a really great thing for the Scouts to volunteer at a community event that gives back to the area schools, but the timing just worked out badly that I wasn’t here. Little man doesn’t love running, but he gets FOMO like his mommy, so he wanted to be there with his buddies. That ship wreck looks interesting! I’ve never seen anything like that (especially in Iowa LOL)…are they very common? I mean, we get a lot of weird stuff that washes up from time to time, but never a shipwreck like this. I’m sure theres a lot down in the ocean between us and the Caribbean, but I haven’t heard of anything quite like this washing up before. That is crazy about the ship wreck washing up! Cannot wait to hear more about your Savannah race! One of these years I’ll make it there to race. Marcia recently posted…What is a Training Base and How Do I Build One? They said it has been preserved under the sand for quite some time. I’m sure the hurricanes the last two years stirred up a lot of things in the ocean. You really need to come to Savannah. Such a great time. I love that shirt! And what a cool story to be able to tell, seeing a shipwreck from the 1800s. Very exciting week for sure! It’s from Raw Threads. I really do love their racerback. The shipwreck was REALLY cool. It was a wee bit smaller than I anticipated, but so neat to think of all the history there. Sounds like a great week! Congrats to little man on his 5K too! Stacie Seidman recently posted…Blogiversary Giveaway Results! It really was. And little man did so well. I’m very grateful to our friends who kept an eye on him for us. Congratulations on your half marathon and to your little man’s 5k!! Your little man is growing up! I would love to visit Savannah one day! Glad you got to go with your friends! Thank you! He’s going to be 10 in two weeks! I can’t even believe it! Savannah is a must-do, for sure! What a week and even though you were quite busy it seems you got your rest too, before the Half so that’s good! Glad you had such a great time at the race and hey at least it only rained the next day! I have a group of running friends though I still mostly train alone or with my husband and / or my friend Vincent. I know quite a few runners in England as well and we’ve been meeting up at events for the last 3 years ! Hence why I’m going to Liverpool again (but just saw a bunch of them in Chicago last year for the marathon). So much fun! Congrats t little man on his race! That is awesome! I’ve never seen a shipwreck close up. Would be very cool though! Good that you went out there to check it out! Rest is importnat. Deep down, I know that, but sometimes, I just want to go all out! Wow, what a great week! That shipwreck adventure sounds really cool. And congrats to both you and your little man on great races! Another great week. Aren’t racecations with friends the best? Can’t wait to hear the details.